From 1 July 2022, the Government will increase the upper threshold of the 19% personal income tax bracket to $45,000. The rates below do not include the Medicare Levy. ➊ The upper threshold of the 19% tax bracket was previously increased from $37,000 to $41,000, with effect from 1 July 2022 (i.e., 2023). In this latest Federal Budget, the Government has announced that this threshold will be increased from $41,000 to $45,000, with effect from 1 July 2022 (i.e., 2023). ➋ The upper threshold of the 32.5% tax bracket was previously increased from $90,000 to $120,000, with effect from 1 July 2022 (i.e., 2023). 2. From the 2025 income year, the 32.5% marginal tax rate will be reduced to 30%. This is in addition to changes already legislated for 2025, to increase the upper threshold of the (now) 32.5% tax bracket from $120,000 to $200,000 and abolish the 37% tax bracket. The Low and Middle Income Tax Offset (‘LMITO’) is a non-refundable tax offset that is intended to benefit Australian resident low and middle income taxpayers. 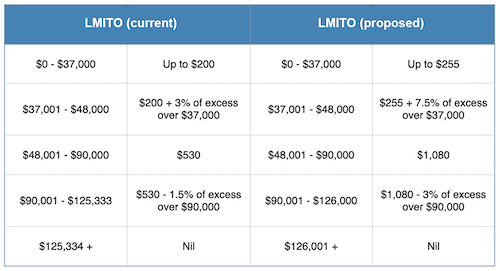 Currently, the LMITO applies from the 2019 income year to provide tax relief of up to $530, with a base amount of $200. The Government has announced that it will increase the LMITO, with effect from the 2019 income year, to provide tax relief of up to $1,080 per annum, as well as an increased base amount of $255 per annum. The (increased) LMITO will be available for the 2019 income year up until the 2022 income year (inclusive) and will be received on assessment after individuals lodge their income tax return. The LMITO applies in addition to the Low Income Tax Offset (‘LITO’). The maximum LITO is currently $445. From 1 July 2022, both the LMITO and LITO will be replaced by a single LITO. In the 2018/19 Federal Budget, the Government announced that the maximum single LITO will be $645. In the 2019/20 Federal Budget, the Government has now announced that the maximum single LITO will be increased to $700. The increased LITO will be withdrawn at a rate of 5 cents per dollar between taxable incomes of $37,500 and $45,000. LITO will then be withdrawn at a rate of 1.5 cents per dollar between taxable incomes of $45,000 and $66,667. • The threshold for singles will be increased from $21,980 to $22,398. • The family threshold will be increased from $37,089 to $37,794. • The threshold for single seniors and pensioners will be increased from $34,758 to $35,418. • The family threshold for seniors and pensioners will be increased from $48,385 to $49,304. For each dependent child or student, the family income thresholds increase by a further $3,471, up from the previous amount of $3,406. 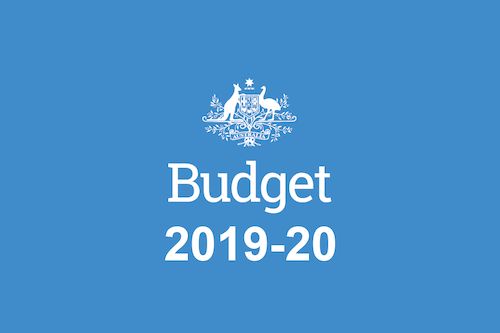 The Government has announced that it is increasing and expanding access to the instant asset write-off with effect from 7:30 PM (AEDT) on 2 April 2019 (i.e., ‘Budget night’) until 30 June 2020. • Increasing the instant asset write-off threshold from $25,000 to $30,000. The threshold applies on a per asset basis, so eligible businesses can instantly write off multiple assets. • Making the instant asset write-off available to medium sized businesses (the instant asset write-off is currently only available to eligible small businesses). Small businesses (with an aggregated annual turnover of less than $10 million) will be able to immediately deduct purchases of eligible assets costing less than $30,000 that are first used, or installed ready for use, from Budget night up until 30 June 2020. Only a few assets are not eligible (such as horticultural plants and in-house software). The Government has already legislated a $20,000 instant asset write-off for small businesses, whereby they can immediately deduct purchases of eligible assets costing less than $20,000 that are first used or installed ready for use by 30 June 2019. However, on 29 January 2019, the Government announced that it would increase the instant asset write-off threshold from $20,000 to $25,000 and extend the write-off for an additional 12 months to 30 June 2020. This means that, when legislated, small businesses will be able to immediately deduct purchases of eligible assets costing less than $25,000 that are first used or installed ready for use over the period from 29 January 2019 until Budget night. These amendments are contained in the Treasury Laws Amendment (Increasing the Instant Asset Write-Off for Small Business Entities) Bill 2019, which was introduced into the House of Representatives on 13 February 2019 and as at Budget night, remains before the House. 1 July 2018 – 28 January 2019: less than $20,000. 29 January 2019 – before 7.30 pm (AEDT) on 2 April 2019: less than $25,000. From 7.30 pm (AEDT) on 2 April 2019 – 30 June 2019: less than $30,000. Small businesses can continue to place assets which cannot be immediately deducted under the instant asset write-off into the general small business pool and depreciate those assets at 15% in the first income year and 30% each income year thereafter. A low pool balance (i.e., the closing balance prior to current year depreciation deductions) can also be immediately deducted if it is less than the applicable instant asset write-off threshold at the end of the income year. Further to this, the current ‘lock out’ laws for the simplified depreciation rules (these prevent small businesses from re-entering the simplified depreciation regime for five years if they opt out) will continue to be suspended until 30 June 2020. Medium sized businesses will also be able to immediately deduct purchases of eligible assets costing less than $30,000 that are first used, or installed ready for use, from Budget night (i.e., 7:30 PM (AEDT) on 2 April 2019) to 30 June 2020. A medium sized business for these purposes is one with aggregated annual turnover of $10 million or more, but less than $50 million. To be eligible, medium sized businesses must also acquire these assets after Budget night to be eligible (as these businesses have previously not had access to the instant asset write-off). As medium sized businesses do not have access to the small business pooling rules, they must instead continue to depreciate assets costing $30,000 or more (which cannot be immediately deducted) in accordance with the existing depreciating asset provisions of the tax law. The Government has announced that it will defer the ‘start date’ of the proposed Division 7A changes by one income year, from 1 July 2019 to 1 July 2020. By way of background, the Government initially announced the Division 7A changes in the 2018/19 Federal Budget, and followed this announcement with the release of a Treasury consultation paper in October 2018: “Targeted amendments to the Division 7A integrity rules”. While the Government has recommitted to reforming the Division 7A regime, the ‘start date’ has been deferred. The Government has announced that it will support the expansion of the data collected through Single Touch Payroll (‘STP’) by the ATO and the use of this data by Commonwealth agencies. STP data will be expanded to include more information about gross pay amounts and other details. These changes will reduce the compliance burden for employers and individuals reporting information to multiple Government agencies. Furthermore, from 1 July 2020, the Government will simplify and automate the reporting of any employment income for welfare (i.e., social security) recipients through STP. Lodge their income tax return if they have an income tax return obligation from 1 July 2021. Confirm the accuracy of their details on the Australian Business Register annually from 1 July 2022. 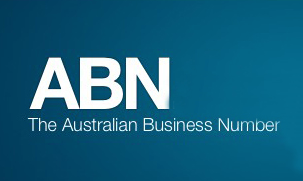 Currently, ABN holders are able to retain their ABN regardless of whether they are meeting their income tax return lodgment obligation or the obligation to update their ABN details. The Government has announced that it will allow voluntary superannuation contributions (both concessional and non-concessional) to be made by those aged 65 and 66 years without meeting the work test from 1 July 2020 (i.e., from the 2021 income year). Currently, people aged 65 to 74 years can generally only make voluntary superannuation contributions if they satisfy the work test. An individual satisfies the work test in a particular income year where they are ‘gainfully employed’ on at least a part-time basis during the income year in which the contributions are made. For these purposes, this will be the case where the member was gainfully employed for at least 40 hours in a period of not more than 30 consecutive days in the income year in which the contribution is made. Note however, the current law does provide a limited ‘work test exemption’ for recent retirees wishing to make voluntary superannuation contributions in the 2020 and later years (i.e., from 1 July 2019). • The member does not meet the work test in the contribution year. • The member met the work test in the previous income year. • The member had a total superannuation balance (‘TSB’) below $300,000 on 30 June of the previous income year. • The individual has not previously relied on the work test exemption to make contributions. The Government has announced that it will allow those aged 65 and 66 to make up to three years of non-concessional contributions under the bring-forward rule (without satisfying the work test). Under current law, broadly, those aged 65 and over cannot access bring-forward arrangements. Individuals up to and including the age of 74 will be able to receive spouse contributions (with those 65 and 66 no longer needing to meet a work test). Currently, those aged 70 and over cannot receive spouse contributions. The Government will delay the start date for ensuring that insurance within superannuation is only offered on an opt-in basis for accounts with balances of less than $6,000 and new accounts belonging to members under the age of 25 years to 1 October 2019. These changes (currently before Parliament) will protect the retirement savings of young people and those with low balances by ensuring their superannuation is not unnecessarily eroded by premiums on insurance policies they do not need or are not aware of. 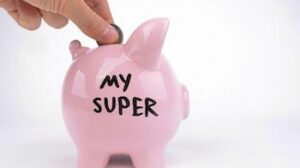 The Government will allow superannuation fund trustees with interests in both the accumulation and retirement phases during an income year to choose their preferred method (i.e., the segregated method or the proportionate method) of calculating ECPI. • The Government will also remove a redundant requirement for superannuation funds to obtain an actuarial certificate when calculating ECPI using the proportionate method, where all members of the fund are fully in the retirement phase for the entire income year. The Government will provide further relief to farmers and tourism operators by amending the luxury car tax refund arrangements. For vehicles acquired on or after 1 July 2019, eligible primary producers and tourism operators will be able to apply for a refund of any luxury car tax paid, up to a maximum of $10,000. Currently, primary producers and tourism operators may be eligible for a partial refund of the luxury car tax paid on eligible four-wheel or all-wheel drive cars, up to a maximum refund of $3,000. The eligibility criteria and types of vehicles eligible for the current partial refund will remain unchanged under the new refund arrangements. The Government will provide an income tax exemption for qualifying grants made to primary producers, small businesses and non-profit organisations affected by the North Queensland floods. Qualifying grants include Category C and Category D grants provided under the Disaster Recovery Funding Arrangements 2018, and grants provided under the On-Farm Restocking and Replanting Grants Program and the On-Farm Infrastructure Grants Program. The exemption will apply where the grants relate to the monsoonal trough, which produced flooding that started on or after 25 January 2019 and continued into February 2019. The grants will be made non-assessable non-exempt income for tax purposes. The Government will treat payments made to primary producers in the Fassifern Valley in Queensland (which was affected by storm damage in October 2018) as exempt income. The tax treatment relates to payments distributed to affected taxpayers through a grant totalling $1 million to the Foundation for Rural and Regional Renewal, working with the Salvation Army and a local community panel. Over two years from 2018/19, farmers receiving Farm Household Allowance (‘FHA’) will be able to exempt income from the forced sale of livestock from the FHA income test when that income is invested in a farm management deposit. This measure will ensure that FHA recipients who are destocking retain access to income support, while making long-term financial plans. The Government will provide substantial funding to establish a dedicated sham contracting unit (within the Fair Work Ombudsman) to address sham contracting behaviour engaged in by some employers. This measure is targeted at those who knowingly or recklessly misrepresent employment relationships as independent contracts to avoid employment and statutory obligations. The Government will provide $1 billion over four years, from the 2020 income year, to the ATO to extend the operation of the Tax Avoidance Taskforce and to expand the Taskforce’s programs and market coverage. The Taskforce undertakes compliance activities targeting multinationals, large public and private groups, trusts and high wealth individuals. This measure will allow the Taskforce to expand these activities, including increasing its scrutiny of specialist tax advisors and intermediaries that promote tax avoidance schemes and strategies. The Government will provide $42.1 million over four years to the ATO to increase activities to recover unpaid tax and superannuation liabilities. These activities will focus on larger businesses and high wealth individuals to ensure on-time payment of their tax and superannuation liabilities. The measure will not extend to small businesses. The Government will provide $57.5 million over five years from 2018/19 to the Department of Jobs and Small Business, the Administrative Appeals Tribunal and the ATO for the purpose of providing access to a fast, low cost and independent review mechanism for small businesses in dispute with the ATO. This measure came into effect from 1 March 2019. Our Business Specialists will meet with you and together we will take the time to understand your unique needs and goals. Northern Business Consultants specialises in financial and business consulting, training and advice ensuring you have the right strategies in place to grow your business. Northern Business Consultants is a CPA Practice, liability limited by a scheme approved under Professional Standards Legislation. © Copywright The Impact Creative 2017. Design by Jess Kitchin.